Ask your average WASP to list his favorite activities you won’t have to wait long before the subject of hunting comes up. Or more precisely, bird hunting. 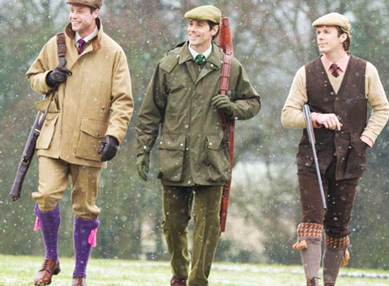 In WASP speak you’ll sometimes hear this referred to as “upland game”, which basically means the kind of hunting where you’ll be wearing tweed instead of camo. If you think about it, the WASP affinity for upland game hunting makes perfect sense. Just consider all the things it has going for it: Time spent outdoors, expensive specialized equipment, retrievers (Golden or Labrador), classic outfitting, and of course a strong English tradition. But unless you happen to have your own country estate, actual hunting is probably not a reasonable everyday activity. Fortunately there is an alternative: Clay Pigeons. In many ways shooting clay pigeons (or just “clays”) is actually a lot better than shooting real pigeons. What the clays lack in sheer WASP appeal, they more than make up for in terms of fun, economy, and for our PETA readers, the fact that you don’t actually kill anything. Shotguns have been used for centuries to hunt fowl and put food on the table, and like many other skills of necessity, it wasn’t long before human nature turned shooting into a skill of competition as well. By the mid 19th Century, competitive pigeon shoots were all the rage across Victorian England. The early competitions were much like those of today, with shooters taking turns firing at targets released on command. Of course there was one major difference; the targets were live pigeons! Gradually, killing birds purely for public amusement fell out of favor and was banned outright by the British government in the early 1920’s. 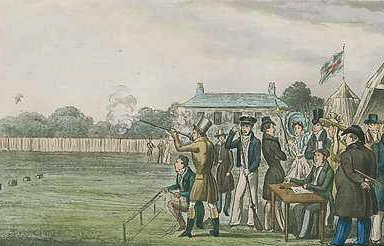 Competitive shooting was popular in Victorian England. The events remain today, but the use of live birds has been banned. In place of live birds, shooters eventually switched to clay discs. Those discs, still called pigeons, were thrown from mechanical launchers at high rates of speed to simulate the flight of the actual birds. 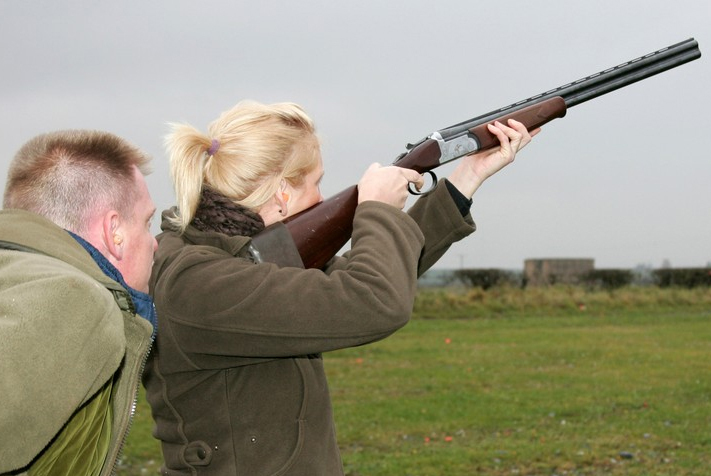 Various games involving clay pigeon shooting caught on and quickly gained in popularity. Trap shooting for example, one the of the oldest and well known clay pigeon games, first became an Olympic sport at the 1900 Summer Games and is still on the slate to be played this year in London. Today shooting sports are experiencing a bit of a resurgence, and not just among the WASP set. Many people across all walks of life are discovering the challenge and fun competitive shooting has to offer. Interestingly the trend is even expanding into the business world as well. Where golf was always the undisputed king of games to conduct business over, more and more businessmen are trading in the 9-iron for a 12 gauge. Aside from being a unique alternative to golf, clay shooting provides more face-time between participants, is more accessible to novice participants, and usually much more economical for sponsors. For the same reasons, shooting events are becoming a popular option for political and even charity fundraisers as well. Fortunately due to the increased popularity of shooting sports, getting started is easier than ever and the absolute best first step is to sign up for an introductory course. Learn to shoot classes are offered at most outdoor shooting centers where, for modest fee (typically between $20-$40), they’ll provide you with everything you need for a day on the range including a rental gun, ammunition, ear, and eye protection. During the actual course you’ll (hopefully) be taught the basics of gun safety, etiquette, and technique. And of course, you’ll also get to spend time out on the range, breaking clay targets under the guidance of an experienced teacher. A good instructor will teach you the fundamentals of shooting and give you the confidence to develop your talents in the future. I took one of these classes a few years back, and again last year as a refresher, and found it to be both enjoyable and educational each time. As an introductory student, it’s assumed that you’re coming in as a blank slate and as such there’s no pressure or worrying about doing something wrong. If you have a question, just ask. That’s what the instructor is there for and you can generally assume you’re getting the right answer. Clay shooting is a fairly easy sport to pick up (mastering it is another story) and accessible to almost anyone. In the last class I took, the students ranged from teenage girls to retired men. By the end of the day, everyone was successfully hitting targets. Try it for yourself and I guarantee that now matter who you are, you’ll experience a sort of primal satisfaction the first time you shatter a clay disc moving at 60 mph in mid-air. A good choice. 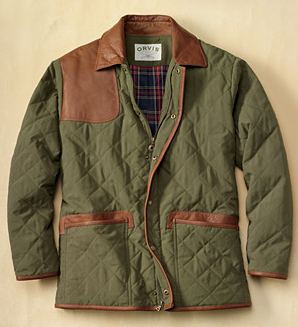 Note the padded shoulder and the large front pockets. Shooting Jacket or Vest – There are a variety of style to chose from, but your main concern is getting something with a nicely padded shoulder and large side pockets. Your shoulder takes the brunt of the gun’s recoil when shooting and depending on the gun, it can leave you pretty miserable by the end of the day. Getting something with good shoulder padding helps alleviate that problem. The pockets you’ll use to hold ammunition or shells. Most games require you to fire 25 shots, so you’ll want something that has pocket space for at least… 25 shells. Eye Protection – Basically you’ll just need something to shield your eyes while shooting. If you wear eyeglasses, then you’re already covered. You could also just wear your sunglasses if conditions allow for it. For more specialized applications, you could get a pair of dedicated shooting glasses which are made with sturdy polycarbonate lenses that are less prone to breaking. It’s up to you. Ear Protection – There are two choices here. You can go with the ear muff style protection, or disposable ear plugs. The ear muffs will provide better protection, but can be cumbersome when shooting a shotgun. I prefer the ear plugs which are much less obtrusive and provide more than adequate protection in an outdoor setting. Note: You can often purchase these at the range, but typically at an added premium. Ammunition – Shotgun ammunition comes in a wide variety of choices. Most of the options will depend on the type of gun you’re using, but in general you’ll want to get “target load” shells loaded with 1 oz of bird shot. Bird shot comes in many sizes, but most ranges will limit you to #7 – #9. The higher the number, the smaller the individual pellets, the more pellets you can fit in each shell. A 1 oz shell of #9 bird shot for example has well over 500 individual pellets! The advantage is obvious, the more pellets you put in the air, the higher the probability of a hit (it only takes 4 to break a clay pigeon). The disadvantage is that the smaller mass of each pellet means that they won’t fly as well or as far as their larger counterparts. #8 seems to be a good compromise. If you’re unsure what to get, you can always buy ammunition at the range, but be aware that it will be more expensive and usually poor quality. The pinnacle of WASP armament: The English side-by-side shotgun. 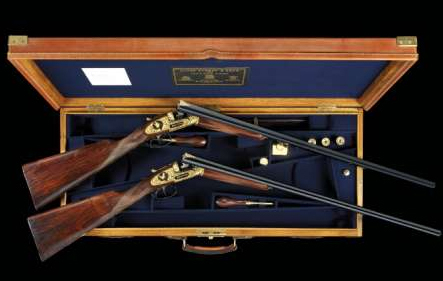 This matched pair made by Purdy costs more than the average house in the US. Shotgun – You probably won’t want to run out and buy a shotgun right away. The better option for the beginner is to simply rent one from the range each time you go. The advantage of renting, besides cost, is that it allows you to try out a variety of guns to determine what you’re most comfortable with. The most likely options you’ll have to choose from are different gauges (12 vs 20) and firing actions (double barrel vs. auto-loader). The double barrel 12 gauge is the WASP standard, but the recoil can be uncomfortable for smaller individuals. At the other end of the spectrum is the auto-loading 20 gauge, which is nearly as effective, but with much less felt recoil. When you get to the point where you’re ready to make a shotgun purchase for yourself, the how to WASP will be here to help! When I took my introductory course, it was a great learning experience, but they neglected one major aspect: What to do next. I had learned all the basics for breaking clay targets, but I still had no idea what the process was for showing up at the range on my own and going shooting. And frankly, that can be an intimidating experience. Visit any shooting center and you’ll see a lot of serious looking guys with guns, all whom appear to know what they’re doing and are deeply intent on doing it. Walking into a situation like that and trying to learn on the fly is usually a recipe for some serious humble pie. Fortunately for you, I’ve already embarrassed myself, so now you don’t have to! With that being said, here’s a quick cheat sheet for two of the most popular games for beginners: Single Trap and Wobble Trap. They won’t help you break any more targets, but they teach you the basic procedures and hopefully give you the confidence to get out and give it a go for yourself. The basic layout of a Trap range. You either pick or will be assigned to one of the 5 stations. Set up there and get ready, but make sure your gun’s breech is open, unloaded, and not ready to fire. Once everyone is set up (1 person per station) firing commences from left to right. If you’re on the first station, load your gun with a single shell, bring it to your shoulder, and prepare to fire. Once you’re ready call “PULL” and the target will be released. Take your shot. If any visible piece of the target breaks off, even if it’s just a sliver, it counts as a hit. If the clay pigeon remains intact, it’s a miss. Open the breech and wait patiently for the other shooters. If you’re not on the first station, wait until the person to your left completes their shot and then take your turn as described above. That process continues until each person has taken 5 shots from their station. 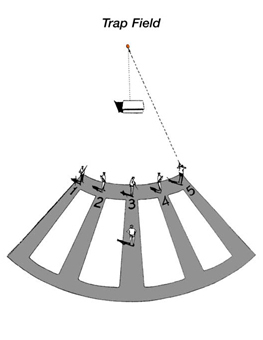 When the last shooter has fired their 5th shot, everyone moves clockwise to the next station down the line and the process repeats until all 25 shots have been taken. That’s all there is to it. Your score is the total number of clays hit out of the 25. One key thing to remember is that your gun should never be loaded or ready to fire until it is your turn to do so! Typical set up for Wobble Trap. Note the launcher in the middle of the stand. Wobble Trap: This game is actually better for beginners since the clays are released closer to shooters. You’ll also see a wider variety of targets (the thrower moves up and down as well as left and right), which can make it more fun. As in Single Trap, you’ll pick a station to begin at. Let’s assume that it’s the second station. Once the shooter at station 1 completes their shot, load you gun with a single shell, get ready and call “PULL”. The target will be released and you’ll take your shot. Open the gun and wait for your next turn. For your second turn, you’ll load two shells, get ready, and call “PULL”. The first target will be release and you’ll take your shot. Whether or not you hit the target, the next target will be released moments after your first shot. Take the second shot, open your gun, and wait. Your third turn is identical to your second. Load two shells, call “PULL”, and take your shots. Once everyone has fired at their fifth target (i.e. completed their third turn), move to the station to your right. If you’re at the end station, return to the first, leftmost station. The process repeats in the same order (1-2-2) at each station until all 25 shots have been fired. That’s it! As in Single Trap, your total score is the number of clays hit out of the 25. No need to keep score yourself as the range employee controlling the thrower should keep track for you. 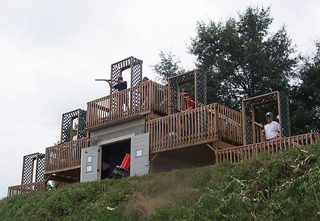 First thing is to find an outdoor range that offers a learn to shoot class for shotguns. The range must be outdoors since most, if not all, indoor ranges won’t allow the use of bird shot. Most people will have a range within an hour of their home, even if you live in an urban area. Google Maps is an invaluable resource here. Sign up for a class. It’s seriously the best thing you can do. You’ll learn a lot and have fun at the same time. Do it! Check out YouTube for more instructional or demonstration videos. If you’re a visual learner like me, they can help make things clearer. If you really get into shooting, check out the USA Shooting Team. You never know, you could find yourself in Rio for the 2016 Olympic Games!